Some days the workplace is at the office, and some days you get to spend outside working the field alongside great people. 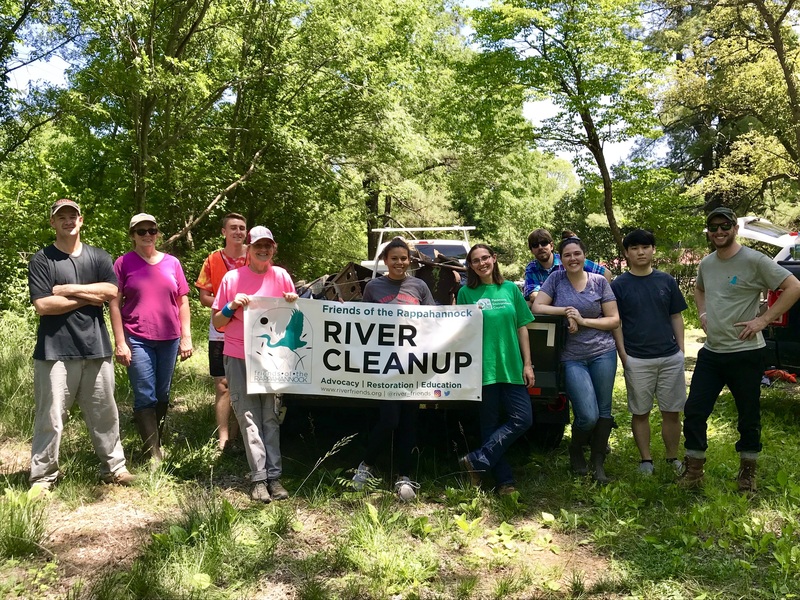 Another Rappahannock River Cleanup was completed on Friday May 25, 2018 thanks to incredible partners and volunteers. Friends and colleagues from John Marshall Soil and Water Conservation District (JMSWCD), Natural Resources Conservation Service (NRCS), and Piedmont Environmental Council (PEC) joined Friends of the Rappahannock at a property owned by Civil War Battlefield Trust along the Rappahannock River in Remington, Virginia. This part of the River is traditionally difficult to get to due to the lack of public access. Namely there is no public access to the Rappahannock River upstream of the Kelly’s Ford boat launch and none in Fauquier County. Fauquier County Board of Supervisor Chris Butler is committed to changing that and is currently researching ways to get public river access in Remington which would enable local conservation groups to provide more and better stewardship to this portion of the watershed. 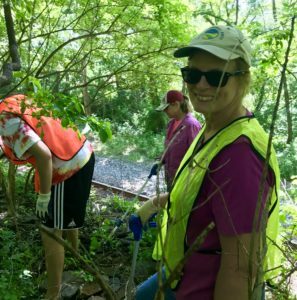 “Thanks to the efforts of all our great partners, we were able to remove 1,100 pounds of trash and debris from the property and areas surrounding the Rappahannock”. said Bryan Hofmann, Programs Manager with Friends of the Rappahannock. “This will hopefully be the first of many cleanups in Fauquier County and the surrounding areas this year”. This effort is another great example of a broader partnership among conservation groups in Fauquier County who all have a stake in protecting and restoring clean water and the Rappahannock River. These groups not only come together to help pick up litter and debris at properties along rivers and streams. The combined impact on water quality is hard to quantify but it is substantial. Thousands of trees planted, hundreds of miles of streams protected, thousands of acres of land permanently conserved, and that is only scratching the surface. Each organization has ways to get involved and would welcome a conversation about their work. Thank you to all the partners and volunteers that made this cleanup event possible!